We have a very strict “no people food” rule in Foster House. This does not mean that the dogs never get food that people would eat – they get veggie Kongs, special holiday meals and recently in this heat wave, frozen yogurt-peanut butter & applesauce treats. However these special treats are always delivered in their own food bowls, or out of their own toys. It’s really more of a “no people food from people plates” rule. 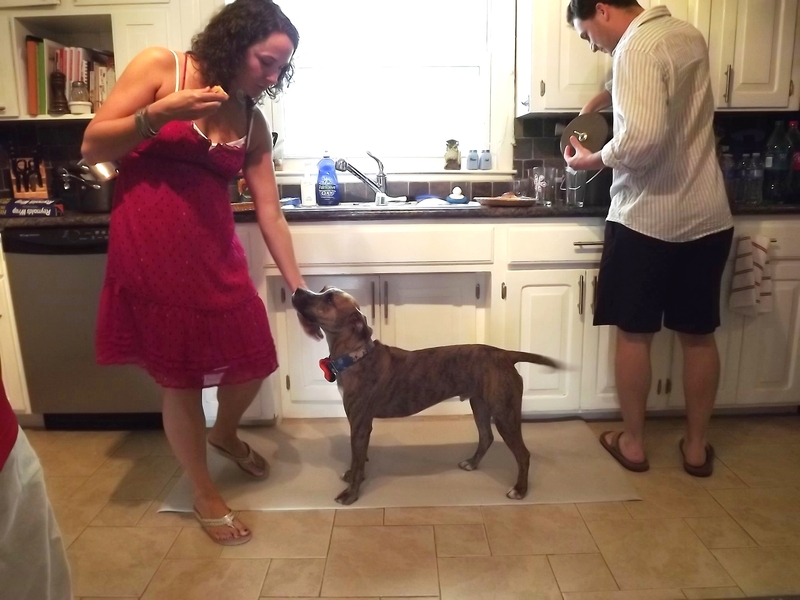 It’s not so much the fact that we don’t want our dogs to have people food. Even though a lot of times, that is the case – some people food can be very unhealthy for dogs, and we want to be able to control their diet to make sure they’re only eating things that are good for them. However even more than that, we don’t want them learning where these yummy treats come from. If they get fed from our plates, or from the dinner table, or from the counter top, they’re gonna learn real quickly that that’s the place to hang out. They’re also going to figure out that if Mom or Dad turns their back for a quick second, it’d be really easy to grab a french fry from their plate. Yes, that’s our dinner, yes it’s take out, and yes we’re eating on tray tables in front of the TV (don’t judge us, it was a rough week). 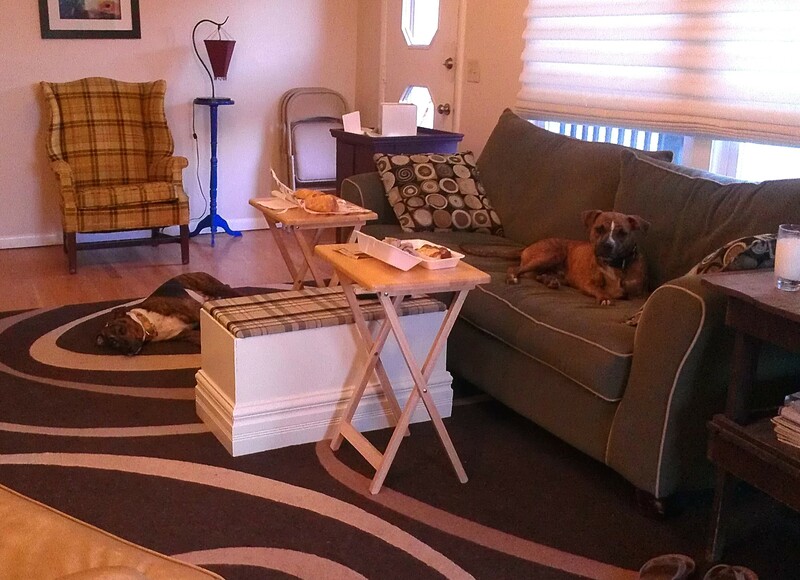 The point is, yes those are our dogs, laying quietly within easy reach of our dinner, while we were in the other room. Didn’t even sniff at it. How do we accomplish this amazing feat? The main thing is that they just never get fed from our plates so they know that begging is futile. When Oscar was a puppy, we’d give him a Kong or an antler to chew on while we ate to keep him occupied. Occasionally if they start sniffing towards the plates, a quick “No!” then a redirect (usually “lay down”) does the trick. As with any training, consistency is key. When you plant a sapling in your front yard, it’s hard to notice as you walk past it every day just how much it’s grown over time. Even if you water it daily and prune it’s branches to keep it healthy, one day before you know it you have a fully grown tree in front of you. In much the same way, the humans at Foster House opened our eyes one day and noticed that our little Cooper-sapling has done quite a bit of developing over the past five months. It’s hard to imagine that the dog responsible for destruction like this is the same dog who now jumps up on the couch and settles in for a snooze when we start going through our “getting ready to leave the house” routine. It’s hard to believe that the dog who couldn’t control his bladder for more than a couple hours hasn’t had an accident in months. So how’d we do it? Since I work so close to home, I’ve been able to come home in the middle of the day for a potty break. We found that this was the key to Cooper’s potty training success. We think that when he realized he wouldn’t have to wait all day, it gave him the confidence to be able to hold it until mom got home at lunchtime. And as the accidents decreased, so has the destruction. We realized that when we would come home to a mess, there was rarely one without the other. The irony of Cooper’s choice in reading material is not lost on us here. We would rarely find a chewed up remote control or dog bed without a puddle on the floor. But there was never a puddle on the floor without some matching destruction of some sort. Talk about a forehead slap moment – Cooper was only destructive when he was frustrated that he couldn’t get outside to do his business! He knew all along where we wanted him to go, and when he couldn’t get there, he’d redecorate. Duh. We’ve been so pleased with his progress that we’ve been experiementing with leaving him along longer and longer. There has been some backsliding here and there when we’d come home to a shredded book or chewed up remote control, but Cooper has done outstanding with Holding It. And as he continues to grow out of puppy-hood and we continue working on him, we’re anticipating more success in other areas as well. Cooper my man, you such an amazing dog, and we are so, so proud of you. You are going to be the perfect companion for a very lucky family. I cannot wait to see what lightbulb will switch on for you next! 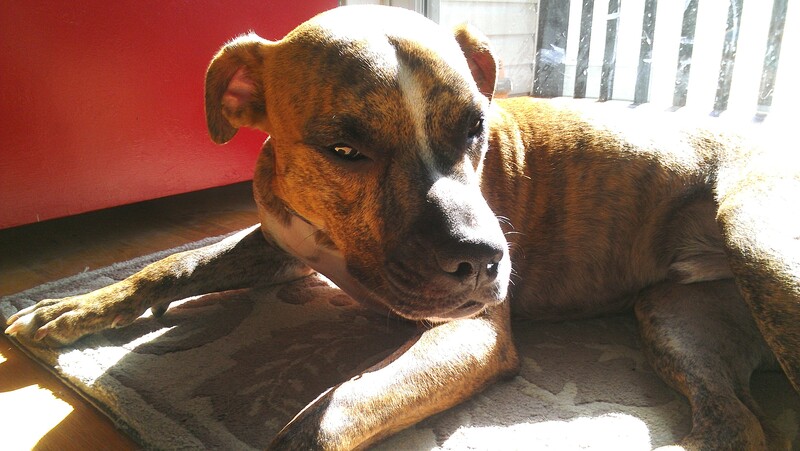 Our man Cooper is coming up on his five-month anniversary at Foster House. And as lovable and charming as we find him, it’s no secret that he needs a little polishing. 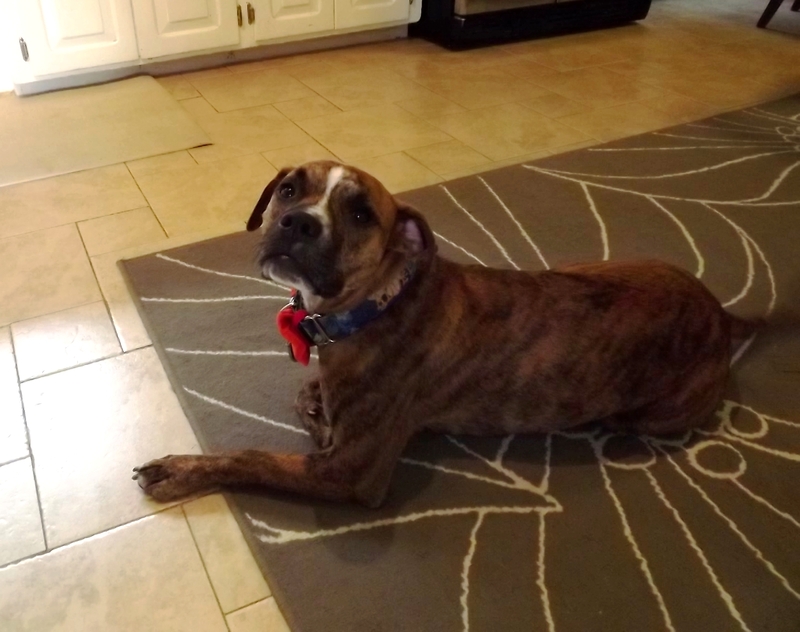 In order to give him the attention he needs (and deserves) to help work out his quirks, we’re going to take this opportunity to refocus our training efforts and go back to being a two-dog household. 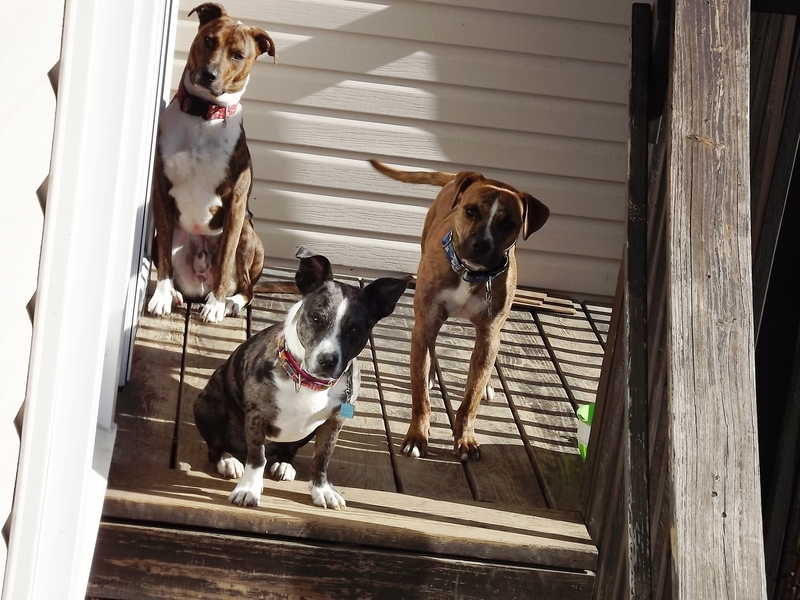 Don’t get me wrong, having three dogs was at times an absolute blast,and make no mistake – our doors will always be open to any of our former foster dogs who need us. 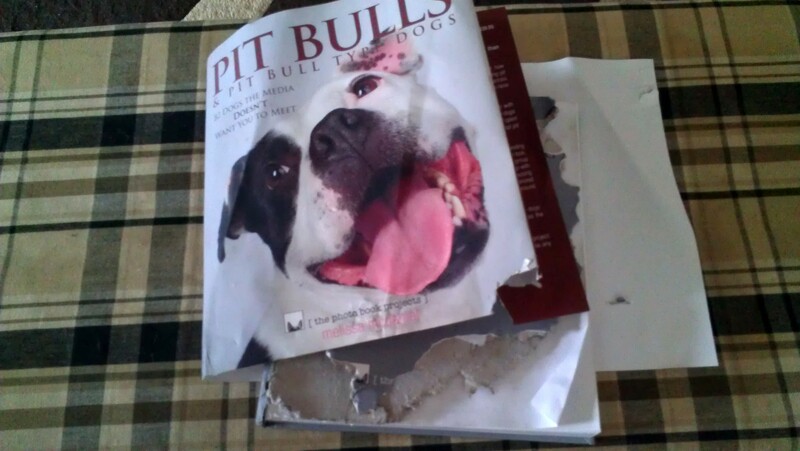 But, three was never “the plan.” We’ve learned what we can handle, and what’s best for us and our dogs. 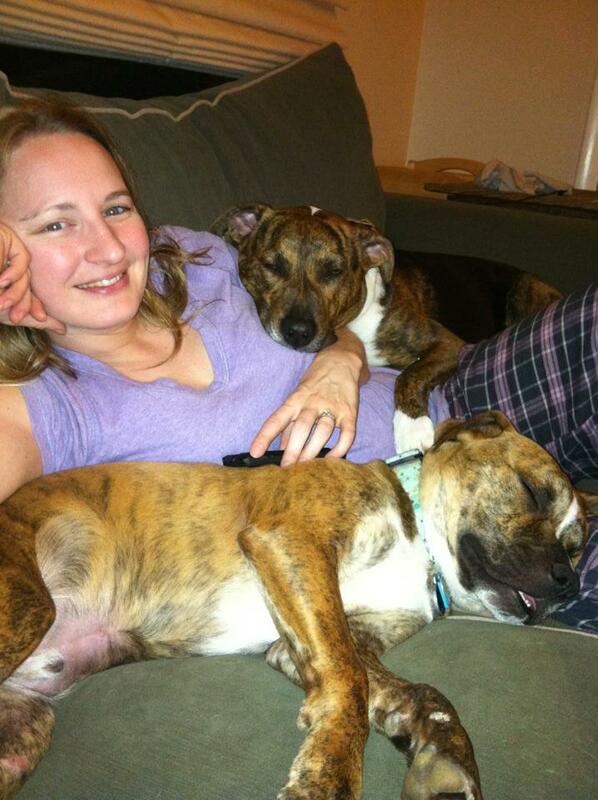 And what’s best for everyone at Foster house is two people, two pups. I think we found it this time, girl! The Furever you’ve really been waiting for. We’ve searched high and low and finally came up with the best home ever for you – and you deserve it! Molly’s new People are Mike and Marla. They lost their beloved family dog, Annie, to old age a year and a half ago. They were understandably devastated, and needed to take some time before they added another furry member to their family. 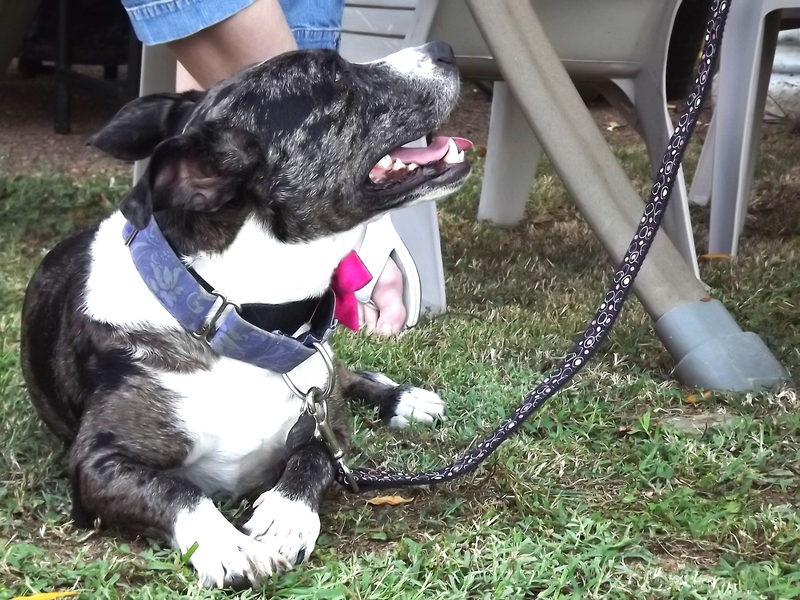 This past winter, Marla saw Molly Tamale’s profile online, and that little spot in her heart that had been reserved for puppy love, that had been locked up tight since Annie’s passing, started to crack open. Unfortunately, Molly got adopted before Marla could inquire about her any further. Disappointed, she put her dog search on hold. When Molly recently came up for adoption again, Marla took it as a sign of “meant to be.” She filled out an application right away, and as soon as Foster Dad and I saw it, our hearts leapt up into our throats. On paper, Mike and Marla were exactly what we had pictured for Molly! But, having been wrong before, we wanted to make sure we got it right for Molly this time. We held our breath and decided that the best place for Molly to show off her real personality would be in the house that she’s used to. 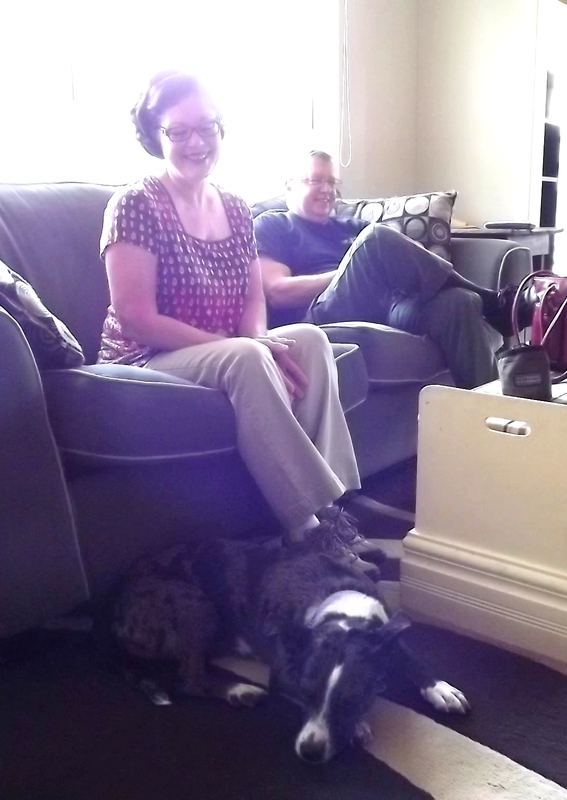 So we dropped the boys at daycare (to eliminate distraction) and invited Mike and Marla over to meet Molly. It could not have gone better! Foster Dad and I have never seen Molly Tamale warm up to a “stranger” like she did with Marla. As we’ve mentioned before, Molly has an independent streak. She’s affectionate in her own way, but she rarely seeks out attention. So when Molly chose, on her own, to go over and lay at Marla’s feet – I knew it was Right. Molly Tamale showing affection in her own way. Molly must have felt the puppy love pouring out of Marla’s heart towards her, because she was glued to her for the entire visit. Mike and Marla were both sold, and so was Molly Tamale. We moved forward with the next step, taking Molly out to their home to we could see where Molly would hang out make sure they had a window. Check and check! Molly Tamale seemed as equally smitten with Mike and Marla as they were with her. I firmly believe that everything happens for a reason. Maybe Marla wasn’t truly “ready” for a new dog in her life during Molly’s first go-round at Foster House. Maybe Molly Tamale wasn’t done exploring the globe yet. Call it fate, call it destiny, call it divine intervention. I call it Furever. Congratulations, Molly Tamale! We love you forever, and we’ll never forget you. Molly Tamale recently had the opportunity to do some community outreach taking part in one of the coolest programs I’ve had the honor of being involved in. This past spring, Agape Animal Rescue partnered with a relatively new organization called The Crossroads Campus. The Crossroads Campus, a 501(c)3 nonprofit, was founded in Nashville in 2010 to save abandoned animals and transform the lives of disadvantaged people. Our mission is to offer hope and healing, provide jobs and job training, create a supportive residential community for at risk young adults, and find loving homes for abandoned animals by giving individuals who are at risk of poverty and homelessness the opportunity to care for homeless dogs and cats. In a nutshell, their goal is to help people by helping animals. Could it be more of a win-win?? Through training people how to train shelter and rescue dogs, the program participants gain confidence, marketable skills and a sense of purpose. 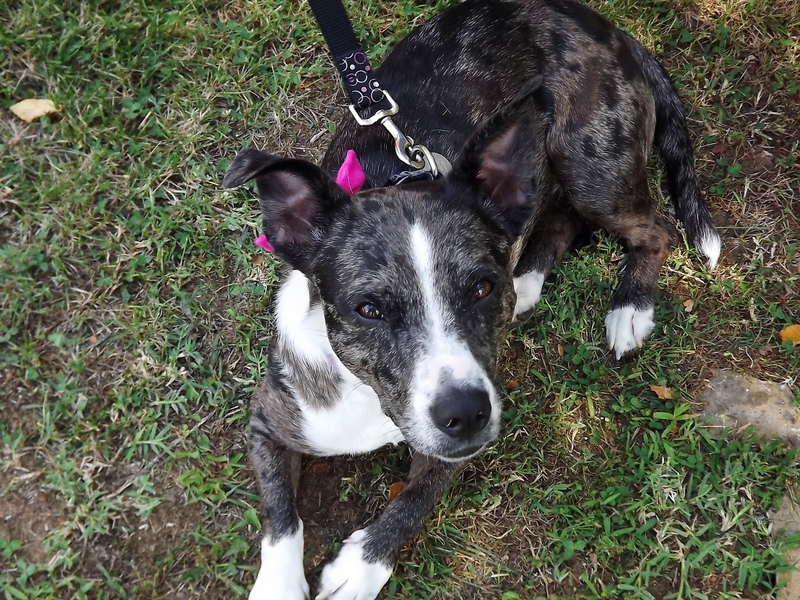 Meanwhile, the dogs become more attractive to potential adopters by getting training and socialization – valuable skills to have under their belt collar when searching for their Furever Home. The program that we were involved with is called Caring Connections. 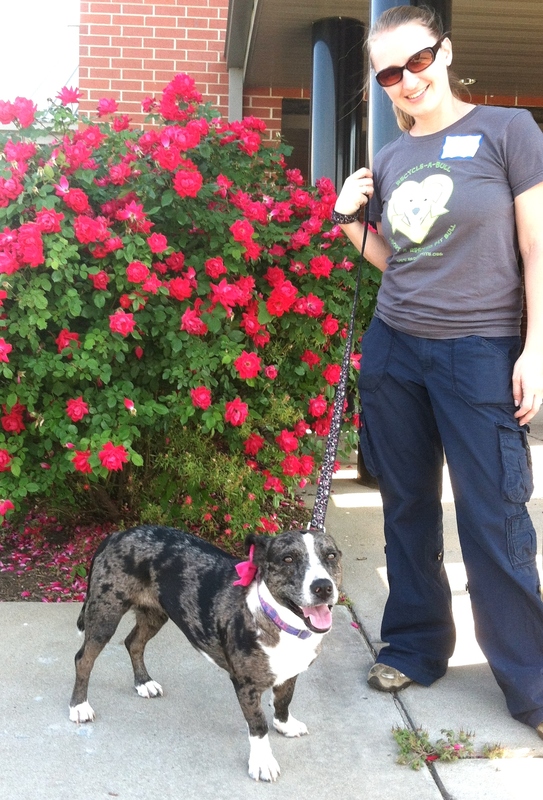 Launched in 2011, Caring Connections is a humane education and shelter-dog training program. 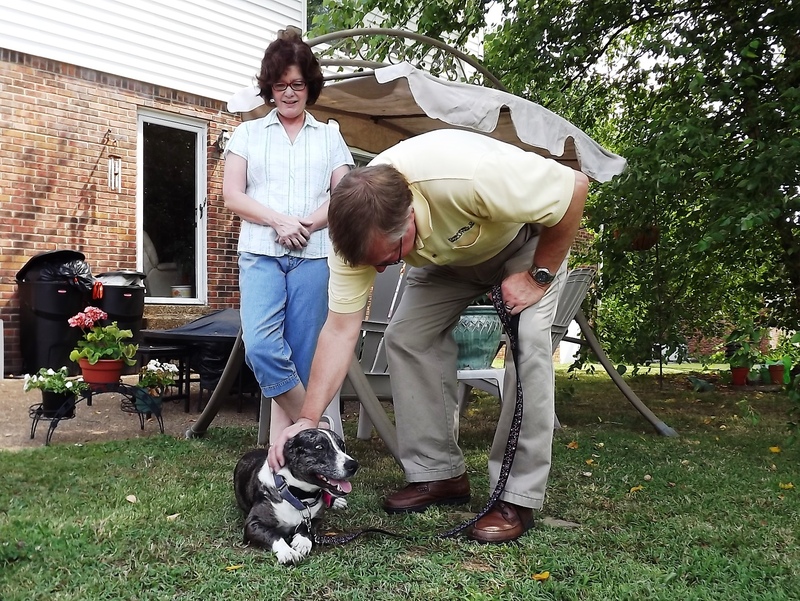 Volunteers take dogs into housing facilities for at-risk youth. 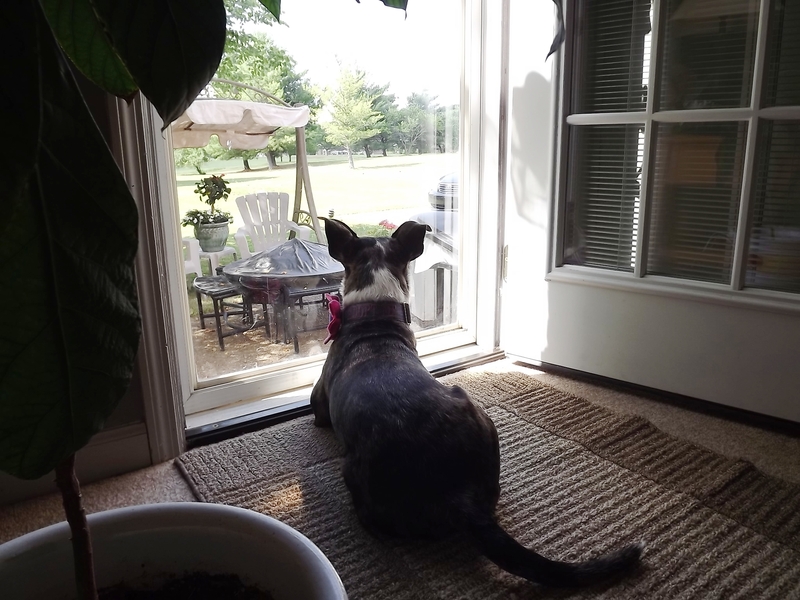 Over six spring Saturday afternoons, Molly Tamale and five other dogs visited the New Visions Youth Development Center, which is the only “hardware secure” facility for adolescent females in Tennessee. The girls who stay here are 13 – 19 years old, and are basically on their last step before adult incarceration. This facility, and this program, are essentially their last chance. Caring Connections volunteers pose outside the New Visions Youth Development Center. Because it is a secure facility, we couldn’t bring our phones or cameras into the building, and I can’t share the names of the girls we worked with. However, I can share a story about one girl who particularly bonded to Molly Tamale. We’ll call her B. B is a 15 year old girl who’s been through the ringer. She didn’t open up a lot about what all she’d been through, but instead listened intently and wide-eyed as Foster Dad and I stood in front of the girls and introduced Molly Tamale and told her story. We explained how Molly had been bounced around at least six times in her short three years on this earth. We told them how she was shy, independent and cautious. and once she trusts you, is totally devoted. My heart broke in two at that moment. I don’t know if Molly Tamale has ever had an unloving hand on her in her life – I like the think she hasn’t. But something in Molly’s behavior struck a chord in B. I like to think that no one in this world wakes up one day and decides to be “bad” on their own. The environment and people around us influence everything we do. Whatever influence over B caused her to do whatever she did to land in New Visions…something hurt her once. B and Molly Tamale were inseparable for the next five Saturdays. B was the first of the girls who successfully got Molly to “down,” something even Foster Dad and I have trouble with sometimes. 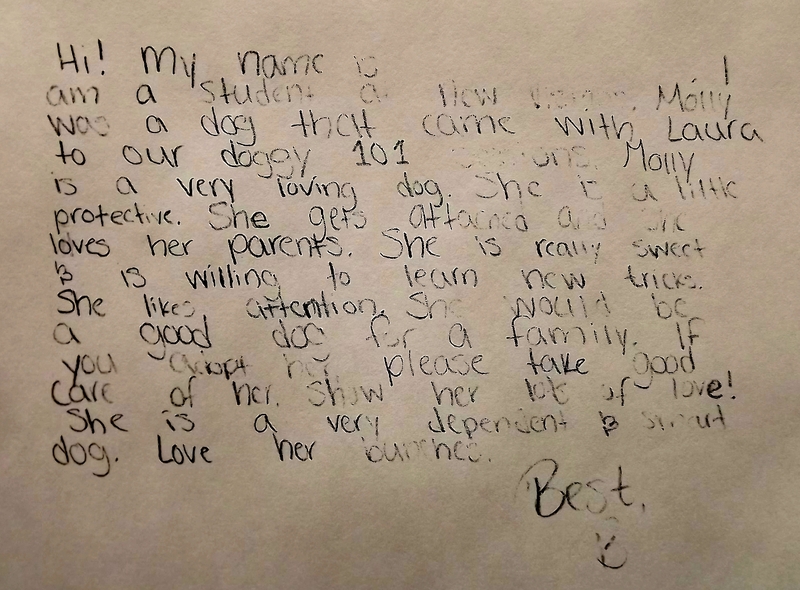 At the end of the session, B wrote a letter to Molly Tamale’s future Furever Family. I cannot say enough about the value of programs like Caring Connections and ones like it all over the country – especially the ones that work with youth. Sometimes rather than confiding in a counselor, these kids find it much easier to relate to an animal who has been bounced around, mistreated or unwanted – because they may see themselves the same way. They’re vulnerable and scared, yet they’re learning kindness and compassion towards animals. They learn what it means to be a responsible pet owner, including the importance of spay/neuter, decreasing the chance of them being involved in animal cruelty and neglect in the future. They’re introduced to career opportunities in animal related fields, and teach them the skills they need to be successful these areas. The Crossroads Campus and their Caring Connections program are still in their infancy. For more information on how you can get involved, contact their Executive Director Lisa Stetar lstetar [at] prodigy [dot] net.